People online across Asia could be enjoying faster access to some services on Internet starting today as news was released that Google switched on its latest high-speed undersea cable, bringing faster connectivity to its services within the region. In 2014, a consortium of six companies that included Google, China Telecom Global, China Mobile International, KDDI, Singtel and Global Transit unveiled their plans to create an undersea, transpacific cable system 9,000 kms in length. The cable spans from the U.S. state of Oregon on the west coast to Japan. A few months ago the cable, which was designed to allow speeds of 60 terabits a second or Tbps of bandwidth, was opened after nearly two years of set up. Now, the faster system has extended from Japan into Taiwan, which is home to the largest data center for Google in Asia. With more of the population, accessing the Internet each day across Asia, hard work was put into developing an infrastructure that was needed to make online access equal for all who live within the region, said a spokesperson for Google. The good thing about this for Google users is its services such as YouTube and Gmail should work faster in theory, for millions of people on the continent. The cable is not as quick as one that extends from the U.S. over to Japan, as the new extension has only promised speeds of as much as 26 Tbps. However, within a region that is prone to tsunamis and earthquakes, Google said it took precautionary measures through laying the cable outside such zones in order to lower the chances of downtime in the network during any natural disasters. Technology companies relying on customers being connected are getting involved more and more in setting up infrastructure that enables important regions to be connected. 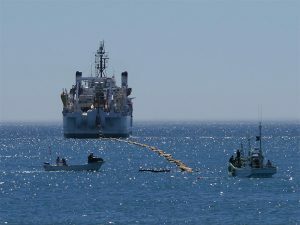 Earlier in 2016, Telefonica, Microsoft and Facebook announced plans for a submarine cable that will cross the Atlantic Ocean. At the same time, Facebook is investing its own satellite technology that will beam access to Internet to large areas of Africa. Google has become active on the same front as well, as it supported the transpacific system known as Unity, that became connected in 2010 and the pan-Asia SJC cable system that became live during 2013. At home, Google is working on a superfast broadband Fiber service it has rolled out on a gradual basis in the U.S.